This is the usual startup lifecycle, but on crack. 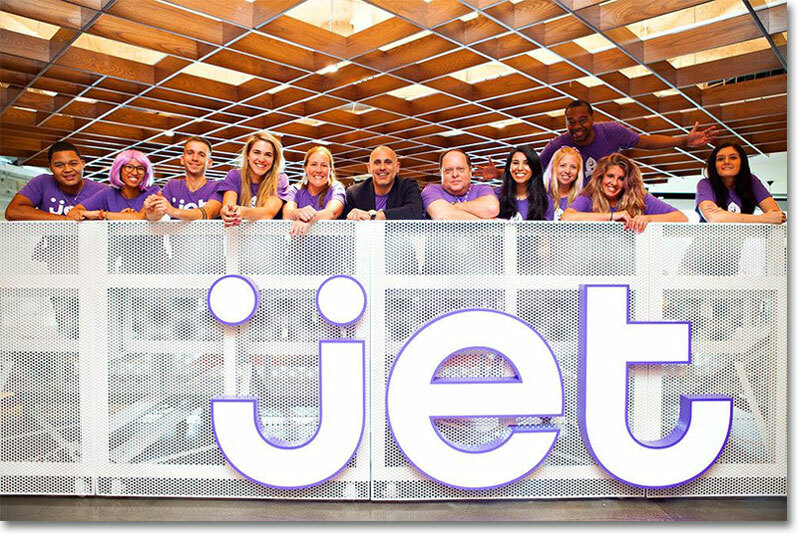 Jet.com was founded in late 2014. It became a unicorn in 2015, hitting a valuation of $1 billion 4 months after its launch. And today, it was acquired by Walmart for $3 billion. Jet’s astonishing rise has made it the biggest US-based e-commerce acquisition in history. And that’s saying something, given that hundreds of e-commerce startups have tried, and failed, to make a dent in Amazon’s near hegemony in that space. Even before it was founded, Jet had several factors that stacked the odds in its favour. Its founder, for one, was an industry veteran. Marc Lore’s previous startup was Diapers.com, and he’d sold it to Amazon in November 2010. From his stint at Diapers.com, he realized that users may be willing to accept longer wait times on obtaining online-purchased goods if they can save money on their purchases. And that led to the USP behind Jet.com. Jet.com introduced an interesting pricing scheme for buyers on its site. Discounts were offered to encourage users to buy more items at once and to purchase items that are located in the same distribution center, thus making the purchases less expensive for the company to collect and ship. As users added items to their virtual shopping cart, they were encouraged to select additional items using pricing incentives. Pricing options were also offered during the check-out process, such as having the user opt out of the ability to return merchandise for free in exchange for a reduced price. Users were also offered a price incentive to use a debit card rather than a credit card for purchases. The strategy clearly worked for investors, and Jet.com managed to raise $565 million from investors such as Google Ventures, Goldman Sachs, and even the Alibaba Group. And they have been paid handsomely for their efforts – investors have realized a near 6-times return on their money. The deal has ramifications for India as well. India has become one of the busiest e-commerce markets in the world, with thousands of e-commerce stores having sprung up over the last decade. The smaller companies have found it hard to compete with the heavily funded trifecta of Flipkart, Snapdeal, and Amazon. But Jet’s rapid rise and subsequent acquisition should indicate that given the right expertise and a unique business model, it’s definitely possible to build companies in the space. And there’s another reason for cheer for smaller e-commerce companies – much like most of them, Jet had never returned a profit.